The roots of Derby Gilbert & Sullivan Company hark back to the 1940's when in Spondon, a parish village on the outskirts of Derby, a choral group was started by the local school Headmaster - Spondon Choral Union. This choir performed secular and religious style music to a very high standard and was successful in many local and national music festivals. When the Headmaster retired and moved away from Spondon the rehearsal venue was also moved. Those members to whom the move was inconvenient stayed at Spondon under the leadership of several conductors and subsequently renamed the Union as Spondon Musical Society. Music styles remained basically the same until 1966 when a concert version of "Trial by Jury" proved so popular that the decision was taken to try out a full production of "HMS Pinafore" in the school hall in 1967. The success of this production initiated a series of yearly G & S productions (Past Productions) in Spondon which continued until the society outgrew the potential of the school hall. In 1980 a move was made, with some trepidation, to the professional surroundings of The Derby Playhouse where the first production of "The Mikado" was again a great success. The company enjoyed such a response they changed their name to Derby Gilbert & Sullivan Company to more clearly reflect the new city base of the company. As things developed Derby Gilbert & Sullivan Company played guest weeks at the Buxton Opera House with "The Mikado" and "The Yeomen of the Guard" and achieved an enviable reputation for the standard of production. Then under the superb direction of one of its founder members, Mr. Andrew Nicklin, the company began to successfully 'updated' G&S productions to great acclaim. 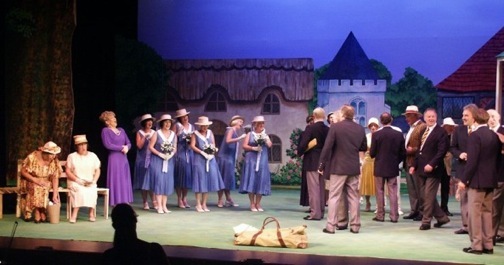 Andrew Nicklin's 'The Mikado' in 1996 shocked The International G&S Festival with it's modern and satirical updating of this G&S Favourite and in the Company's first appearance at the Festival the company were awarded 'The Adjudicator's Special Award' for Innovation - a mark of things to come. The extent of this overall standard was recognised in 1997 when the company's production of 'Princess Ida' won the Derby Playhouse Eagle award for Best Amateur Musical seen by the adjudicators in and around the city during the '97 season. Then the company took this same production to Philadelphia, USA to enter the 4th International Gilbert & Sullivan Festival. Here they won awards during the Philadelphia leg for Best Female Voice (Deborah Norman), Best Character Actor (Peter Barlow), Best Character Actress (Margaret Askam) and Best Chorus. At the final awards night, held in Buxton after the final leg, Derby Gilbert & Sullivan Company were adjudicated the Overall Festival Winners, and also won the Best Amateur Producer (Andrew Nicklin) and Best International Female Voice (Deborah Norman). At the 1998 festival at Buxton Derby G&S Co. complemented their trophy cabinet with 'The Pirates of Penzance' by coming away with second runner's up prize to the Overall Festival Winners, Trent Opera Company. Consolidation of Derby G&S Co.'s quality of performance came in 1999 when the company became overall winners of the International G&S Festival for a second time with their 1999 production of 'The Yeomen of the Guard'. The 1999 Champions also took awards for Best Male Performer (Stephen Godward), Best Female Performer (Elizabeth Watkins), Best Supporting Actor (Simon Theobald), Best Musical Director (Christine Nicklin) and Best Amateur Producer (Andrew Nicklin). Other members of the company took awards for other performances including Best Male Voice (Nick Sales) and Best Female Voice (Debbie Norman) both with Trent Opera's 'Utopia Ltd'. The 2000 millennium became another award winning year for the company with 'Iolanthe' taking the Overall Winner at the 7th International G&S Festival. Other prizes won at the festival were Best Animated Chorus and Best Producer for Andrew Nicklin. 'The Mikado' in 2001 was placed 2nd Runners Up to South Anglia's production and also won Best Male Performer (Patrick Dawson), Best Male Voice (Stephen Godward) and Best Chorus as well as nominations in almost every other category. 2002 was another monumental year for the company. Our new President, Glyn Hepworth, helped the company immeasurably by organising our now highly acclaimed 'Dinner and Operetta Evenings' which kick started the year in January. Another D&O in March lead us up to 2002's production week. Opening with a fantastic Gala Concert on 26th May and then five performances of 'The Gondoliers' the production week was a success with the audience who attended, but unfortunately the company did make a loss. We had time for another D&O in the middle of July before the company jetted off to Seattle to join the Seattle G&S Society and perform three nights of our 2000 production of Iolanthe. Back in the UK for less than two weeks and the company performed 'The Gondoliers' one last time on the Awards Night of The International G&S Festival. A deep breath and into the concert season! 2003 was a challenging year with the Derby Playhouse choosing to move all non-professional productions into summertime slots which had a huge effect on our ticket sales. However our 2003 production of Ruddigore went on to scoop many awards from the 10th International G&S Festival, topped by being crowned Overall Winners for the 4th time. 2004 was harder still with the company having no choice but to end its 23 year relationship with the only true theatre venue in the city of Derby and move its 2004 production of HMS Pinafore to the Assembly Rooms Darwin Suite. The company rallied, as always and gave six fabulous performances to packed houses. 2005 and 2006 saw more multi-award winning productions with Andrew Nicklin's 'The Sorcerer' and 'The Pirates of Penzance' respectively. Both productions took the top prize at the International G&S Festival amongst many other awards. The company also took 'The Sorcerer' to the Waterford Festival of Light Opera and bagged the prizes for Best G&S Opera, Best G&S Director, Best Chorus and Stephen Godward won Best Male Singer for his Dr Daly. Can you believe all of this in the same year that the company took HMS Pinafore to Nanaimo in Canada! It was Canada again in 2007 when we took Andrew's revamped 2002 production of 'Iolanthe' AND the 2006 production of 'The Pirates of Penzance' to Nanaimo once again! See our BLOG for more details on Canada 2007. For 2008 DGSC were delighted to have been offered the rare opportunity to perform in the very exclusive Victorian Theatre within Chatsworth House! Three performances of 'The Pirates of Penznace' were be performed to a Sold Out audience with special events including 'Cornish Cream Teas' and a 'Black Tie Gala Night'. Such was the success that 2009 saw DGSC back at Chatsworth - on the calendar for the foreseeable! 2009 however will be remembered for the absolute honour of being asked to bring the opening show to the newly resurrected 'Derby Theatre' - DGSC was back on home turf in the theatre that the company had performed in since 1980. 2010 saw the company on another trans-Atlantic trip to Gettysburg, USA to take part in the 17th International G&S Festival. 2011 was another fun packed year for the company with various concerts throughout the year including an appearance of Alistair McGowan as the Mikado in Derby, an entry into the 18th International G&S Festival and a trip to perform in Lanzarote! 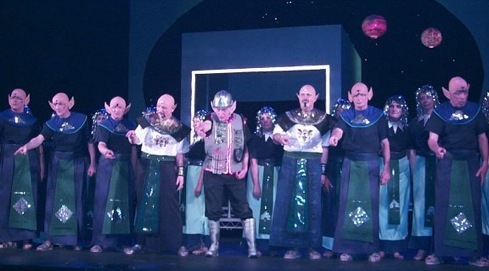 2012 saw another trip to Lanzarote, another well received production at the 19th International G&S Festival, a concert including G&S pro, Simon Butteriss and the company's first trip to the Bollington Arts Centre in Cheshire. 2013 was another revelation when the company performed their annual production in the recently refurbished Duchess Theatre, Long Eaton, a newly positioned Annual Concert at Derby Playhouse and numerous concerts and appearances across the country. 2014, 2015 sees the company going from strength to strength - why not join us..
You can contact production, design, support and Front of House staff by email here.